You can see it from Interstate 25. 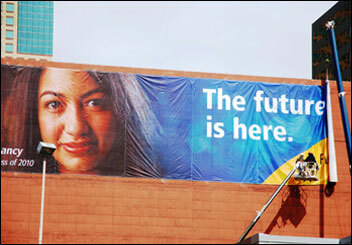 The new banner, 125 feet wide and two stories high, went up on the southwest side of the building at 15th and Lawrence last week, affirming the site as the future home of the University of Colorado Denver Business School. Business School faculty and staff streamed past one faculty member's office on the second floor of the CU Building throughout the day on Tuesday, April 6, peering out his window as the banner was slowly unfurled. Others in the university community walked down Lawrence Street staring up in wonder. The school has been working on plans to transform the former office building, bought by the university in 2008, into a new high-tech facility that will bring together faculty, staff and students currently spread across nine downtown Denver locations. The new site will house all the school's programs and centers and will act as a center of knowledge and education for Denver's business community. Dean Sueann Ambron was pleased with the placement, saying, "For the first time you can see the Business School from I-25. You can sit lots of places in Denver and look out and see us. The banner is beautiful, but it's just the beginning. It represents that something bigger is happening. It hangs on a building that will become the beacon for business and a gathering place for students, businesses and great minds." 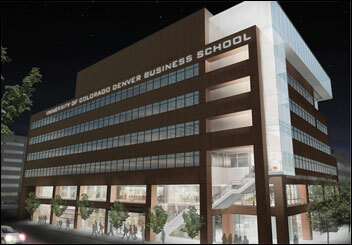 For renderings, photos and more information on the future home of the Business School, visit the building Web site. Physicist's underground work results in dark matter "sightings"